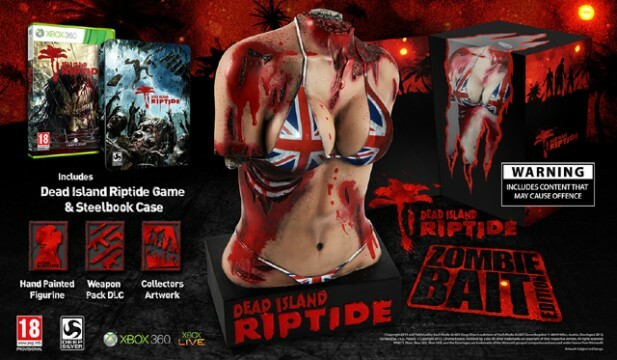 Last January Deep Silver found themselves in a bit of Internet hot water after announcing that the Zombie Bait Edition of Dead Island Riptide would come with a 31cm-tall statue of a mutilated female torso dressed in a UK Union Jack bikini. The publisher quickly apologized for the marketing decision, and claimed that they “sincerely regret [the] choice”. Fast forward three months, and Deep Silver’s disgusting bloody half-naked female torso statues are currently sitting on retail shelves in both Australia and New Zealand. So much for the apology. The existence of the Zombie Bait Edition statues were initially made by Twitter users, and they have since been confirmed by Deep Silver parent Koch Media to be available for purchase in “extremely limited quantity”.